My Shitzu-Daschund mix-breed dog Sophie got her full grooming make-over just over a week ago. Actually, she was scheduled by February but since I accidentally cut her skin (ouch!) while I’m trimming her coat and I already saw that her coat is not in good condition anymore that is why I decided to take her to her vet asap. It was hard and sad for me to leave her at the grooming clinic as she was crying when I put her on the cage. I know she doesn’t want to be left there. Since she’s not easy to manage while she’s being groomed, groomer always sedate her with the assistance of a veterinary. Don’t worry bebe your coat will grow back in few more months. Promise, by Christmas time, your coat will be long again. Poor Sophie, she looks so sad. Just in case you’ve been in my other personal blog, you might have read that a very generous fairy landed on my blogs and rewarded me for the good job that I have done. Actually, I’ve been stalking Fairy Hobmother for a while now, jumping from one blog to another whom he (yes he) has showered with gifts already. I was intrigued and wishing fervently that he’d pick my blog/s as the next recipient of his generosity. I'm just so happy when I got an email and he finally noticed my blogs after praying, wishing and waiting patiently. He’d probably also sensed that I’m looking for a new washing machine that’s why he’d contacted me. I was spinning and could not hide my excitement for the gifts that he gave me and it’s already a very early birthday gift from him. Thank you Fairy Hobmother, I wish that you'd not get tired of spreading joy and happiness to all the bloggers who worked hard. After all, we need not just a good pat on our shoulders but also some moolah to spend for shopping.. Teehee! Make your presence known here. 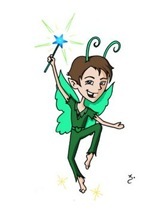 Leave your comments and your blog’s URL for he is on the lookout for the next blogs that he can sprinkle his fairy dusts! 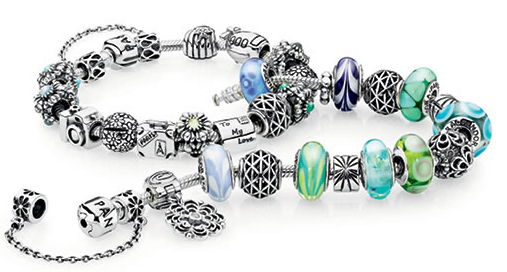 I Want a Pandora Bracelet! I fancy bracelets more than necklaces. I do have a silver bracelet with heart shapes and ball charms in it that I bought from a friend last year and it has been my favorite every since. I also recently bought some silver and dual toned bracelets at Forever 21 couple of months ago that I wore together with my silver charmed bracelet. I though I was ok having those fave bracelets that I have right now but when I saw a Pandora bracelet with beautiful pandora charms from a friend's IG (Instagram) account, oh boy it made me drool.! Knowing that she can afford almost anything she wishes, I was left admiring this bracelet. Look at how nice it is, I hope I can also surprise myself with this kind of bracelet on my coming birthday or maybe Christmas! Typhoon Karen already left the country yesterday but it's still raining non-stop for the last two days brought about by the monsoon rains. Due to that, massive flooding in Metro Manila and nearby provinces happened leaving people no choice but to evacuate again in the evacuation centers. Those that stayed at their homes have to brave the knee, waist or even chest deep waters at their homes. Ahh.. so sad. Lately, all things have changed. With continuous rains even if there's no storm for sure it will be flooded in many areas. It only means that we have no more trees in the forest and mountains that can hold rain waters. Aside from that, esteros, creeks or river are already polluted with garbage and even squatters that prevent the flow of water. I just hope there is still hope and solution to this problem not just in Metro Manila but I guess the whole country already. Today, pre-school and elementary both public and private schools have no classes as what our mayor has announced last night due to flooding in many areas. The other day, I heard my 9 year old niece loudly singing at their house after she came home from school in the afternoon. I quickly get up from my sit to see what she is doing and I was smirking when I saw her singing in front of the computer. With headphone on her head she didn't hear me coming so she's a bit shocked when she saw watching her. Apparently she's watching Charice on Youtube singing her own "Pyramid" song. It's one of her fave singers at the moment and singing her songs makes her excited even though I teased her sometimes. Our family is not that musically inclined but it is nice to see them sing and from time to time play the guitar as what my niece and older nephew are fond of doing. When I was younger, I wanted to learn how to play the piano and the guitar but for some reason after experimenting or tinkering with the musical instruments that we have, it never became my passion or I never grown to love them. If my nieces and nephews will develop likeness or passion in music then I have to support them especially now that we can purchase music instrument online. Oh dear, it's September already! August just slipped away so fast huh. More BER months are coming and in no time it'll be Christmas soon. It's funny because as soon as Sept. 1 came, I already heard Christmas songs on TV and on the radio and it only shows how we Pinoys are crazy over Christmas! We have the longest Christmas season as they say. I;m just so excited over the events that will happen in the coming months and it only means that I need to work extra hard to save. Anyway, just poppin' in here to welcome the September. Our town has been known as one of the major supplier of woods, panels, doors, jambs, cabinets and anything wood related. There are many contractors and makers of chairs, tables, cabinets and more using different kinds of woods. Woodworking shops are almost everywhere and they have been delivering finished wood products almost all around the country for residential and commercial use. If you are into wood working industry, aside from employing good artisans, getting quality machinery that can help you with the cutting and fabrication are very essential. Manually cutting tons of woods is just too impossible for it can take long hours and hard work just to finish cutting. These days, as technology advances, more advanced and hi-tech machinery have been invented to make fabrication and manufacturing faster and accurate. Computer aided cutting machines also make precise cutting and designing thus helping woodworking shop owners cut their production costs and time. These machinery like the cnc router that can cut wood, non-ferrous metals and plastics with precise cuts not only bring cutting wood materials to a whole new level but gives cutting edge technology two thumbs up from the woodworking industry. If you are looking to buy new and late-model or used woodworking machinery, Machinery Masters Corporation offers a lot of machineries that you can use in your shop. Check out the available machines like edgebander, panel saw, molders, presses, ripsaws, sanders and lot more that are for sale. All machines have photos and descriptions that can aid you in choosing the best machinery for your shop. Aside from the wide array of machineries in their catalogue that are available for purchase, you can also advertise and sell your own machinery and that is free of charge. Simply fill out the form in their website and submit your request. With over 60 years in the woodworking, metal and plastic industries, Machinery Masters Corporation sure knows how to provide their client not only quality machines but service as well.